Oh I love the cool little crown on this adorable frog. And it looks like it’s fairly small, making it even cuter. The pattern calls for three colors in a worsted weight yarn, an F crochet hook and stuffing. 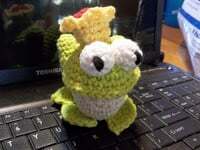 If you enjoyed this free crochet pattern you might also enjoy more designs by Sheep of Delight.